WE’VE MADE SOME CHANGES! VISIT OUR NEW UPDATES PAGE! NEW SHIPS ARE ON THE WAY! THE ADRIATICA LINE’S SAN GIORGIO AND SAN MARCO ARE RELEASED! OUR HOME LINES AND NORDDEUTSCHER-LLOYD SHIPS HAVE ALSO BEEN RELEASED! OUR MODEL ARCHIVE PAGES HAVE BEEN RESTORED! STAGE 5 IS IN PROGRESS! THE PROJECT ARCHIVES PAGE IS IN DEVELOPMENT! PLEASE, VISITORS: KINDLY MAKE A SMALL DONATION! THEY WILL HELP AND SUPPORT US TREMENDOUSLY! BIGGER THINGS ARE YET TO COME, SO PLEASE STAY TUNED! Here you’ll find a vast collection of 300 models (and counting) of various vessels including ocean liners and cruise ships which were all developed over the course of 3–5+ years by Fabricio A. Brusa, and were collaborated upon by his development partners Christopher Rich, Alfonso del Plato and Marco Giambarresi. These models are all currently in development for usage (or sailing, rather) in Ilan Papini’s self-developed 3D simulator, Vehicle Simulator (VSF). Our models were originally constructed as references for Fabricio’s architectural studies which now involve his education and future career, along with nautical elements and aspects such as architectural observances of various classic ocean liners. Christopher opted to extend support and collaboration for the development of Fabricio’s 3D liner models and the models’ operational compatibility for Ilan’s simulator in August 2014, and still currently is. However, we would certainly like to thank all of our visitors and supporters very much for their saintly patience and gracious support shown during the painstaking development and conversions of these models, as well as for their interest, feedback and suggestions provided for the project itself thus far. Please feel free to stick around and explore the other parts of the website, so please check out which ships are currently in progress on the Liner Progress page, also check out what’s available to download in the Download section, and more importantly, by all means enjoy yourself while browsing our site! Any additional dates involving any important news or conversions will be added to the infoboard accordingly. If applicable, the reason for the date being changed will be provided, as they originally were. We recommend using an ad blocker to skip YouTube ads between tracks. Skipping tracks too quickly however will jam or glitch the player, so refresh the page if this occurs. 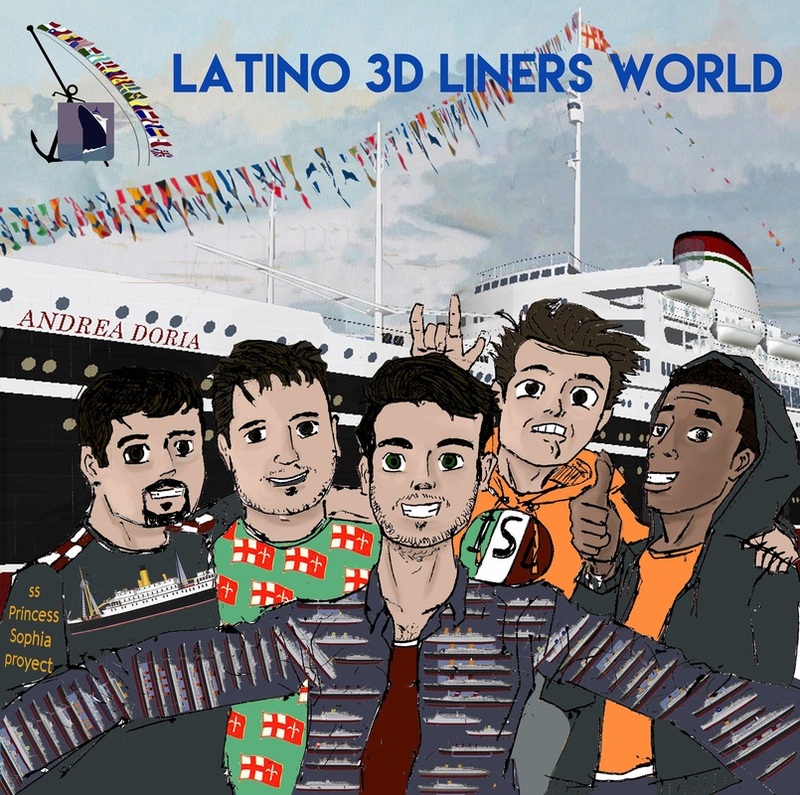 Fabricio has thoughtfully decided to create a beautiful sketch piece of the current administrative team operating his Facebook group Latino 3D Liners World, as well as the known individuals involved in the collaboration of this project, such as ourselves. From left to right in the sketch featured are Tomas Torres, Marco Giambarresi, Fabricio Brusa, Alfonso del Plato, and Christopher Rich. Appropriately yet lovingly enough, the ship featured in the background is the Italian Line's Andrea Doria (1951), of which undoubtedly has a special place in all of our hearts, despite her untimely and unfortunate demise. On behalf of the administrative team members of the Facebook group and the remainder of the liner project team members, Fabricio, we would all like to extend our thanks to you once again for this marvelous piece of representative artwork you have produced. For that, it is going to stay featured here on the homepage of our liner project website here for everyone else to view, and for not only our own satisfaction, but for our viewers and supporters’ own as well. You’ve been much more than a wonderful friend, respectable colleague and reputable individual to all of us for a number of years, and again we honestly can not thank you enough for allowing us to have the opportunity to experience that from you. We love you man; very much too. Thanks a million times and more, because you honestly deserve each one. All rights reserved. Website created by Christopher R.